Ribera is an Italian artist originally from Spain, who created graphics and painting in a realistic genre. His favorite theme was religious subjects and portraits of his contemporaries. “Chromium” – a canvas painted by the artist in 1642. It shows the figure of a little boy – a beggar and a cripple. The mutilated bare right foot seems to be deliberately put on display. The suit of the boy is old, in some places wrecked. In his hand he holds a leaf of a beggar with a plea for help. And on the face shines a sincere childish smile. He has a difficult fate, but the boy does not seem to know about it. So much cheerfulness in the expression of his face, so much purity and light! With the same great love for all living things, this portrait of a Spanish-Italian painter wrote. The lame boy looks from the canvas into the eyes of the spectators, straight into the soul, hoping that he will receive the same look in response. 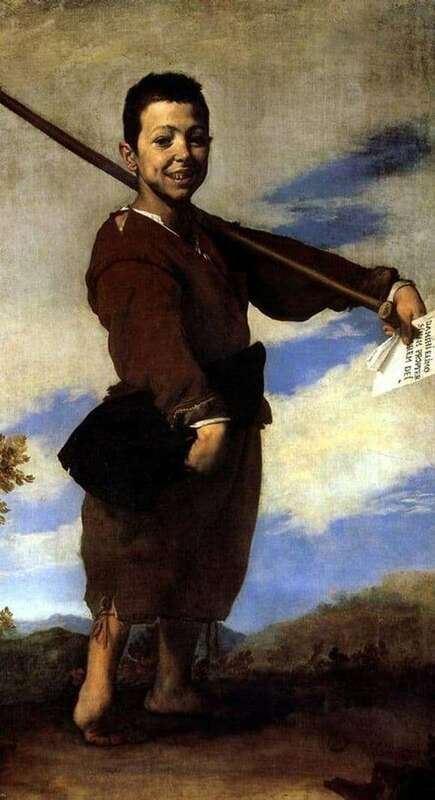 The background for the character of Ribera’s canvas depicted a landscape: a low horizon of hills overgrown with wild grasses and a sky covered with white clouds. The figure of the boy is written as the nobles wrote: the character’s gaze is directed from top to bottom. This technique gives the picture some solemnity, monumentality. The boy probably knows that the writing artist perpetuates his image almost forever. Therefore, he is so happy and proud of himself. The master gave us an elusive inner beauty to the child, his spiritual strength, spiritual harmony and moral purity. The character is strange, imperfect in physical form, but so perfect in its expression, real like life itself. Work belongs to the late period of the painter. Until the end of his life, Ribera’s artistic gift blossomed with bright, informative masterpieces, revealing new buds – the facets of the rich, folk soul original master brush. Now “Lame Peep” gives its charming smile to visitors of the Paris Louvre.